So you are probably wondering by now, apart from feeding, sleeping, crying and pooping – what exactly do babies do? It might not seem like a lot, but in the first few years of a baby’s life there is actually a lot happening – and you will get to watch it as your baby brother or sister grows up! Here are some things to expect once the new baby gets home from the hospital. 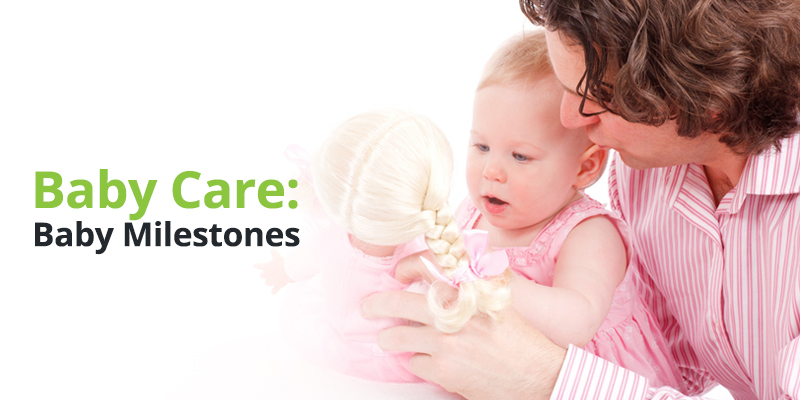 These are called milestones, and they are things that babies learn to do as they are growing up that will help them later on when they get bigger. A one-month old baby still needs head and neck support because he cannot raise his head on his own but most babies can lift their head briefly by this age and will turn to the sound of their parent’s voice. They can see things best that are about 8-12 inches away and are attracted to patterns of black and white. By three months old, most babies will begin to smile and also imitate other facial expressions – including yours! By this age, they babies and lift and support their own head and will even do mini-pushups with their arms when they are laying on their tummy! They will begin to roll over on their own and will also push down with their legs when your parents hold them in a standing position. During this times, babies will learn how to smile and laugh and also “babble”, making nonsense noises that will later turn into speech. It is around this time that babies will start to eat some solid food, though they will still breastfeed for another 8-10 months (and sometimes longer). By 7 months, babies will respond to their own name and also to the tone of a parent’s voice. They will also be able to roll over by themselves and sit up without your parents holding them. By around 6 months, most babies will weigh TWICE AS MUCH as they did when they were born! One thing you will notice about this age is that your baby brother or sister moves around A LOT more! Most babies will be able to scoot themselves across floors, crawl, and not only sit on their own but pull themselves up to a standing position (they cannot stand on their own but can use things like coffee tables or other pieces of furniture to hold themselves up). They will usually be eating three solid meals a day now along with breastfeeding and will even begin to feed themselves a little: they will develop what is called a pincer grip, where they can pick up objects (such as small pieces of food) by themselves. They will also start to use their first words, often “mamma” or “dada”. Babies are turning into toddlers in this second year of life. They will begin to walk on their own (though they are still pretty unsteady at first!) and will also start to climb on things – which can sometimes get them in big trouble! They will start being able to do other physical things as well, like standing on their tippy-toes and kicking a ball. Your baby brother or sister will be able to use several words by the time they turn two and even put them together to make short phrases. They will also start learning to understand directions (though that doesn’t mean they will always follow them!). Their vocabulary will start to grow even more and they will start being able to pick up new words that they hear in books as well as learning things that will help them when they start school, like how to identify shapes and colors. You will also notice that as they grow into a toddler, they will start wanting to do more things for themselves – and might have more than a few temper tantrums as well! Many toddlers will also start potty training around this time. In short, there are a lot of exciting things going on in the first two years of a baby’s life. And as a big brother or sister, you can help them a lot as they are growing up and can watch all the amazing things they start to do as they get bigger!